hunger | What's for lunch? Last Saturday I had the pleasure of talking to Mary Ito at CBC’s weekend morning show, Fresh Air, about What’s for Lunch? I told her about the learning curve I’ve had in my first experience writing for children. I talked about how I’ve heard in the past that if you really want to figure out if you understand something, explain it to a child. I think it’s true—have you ever tried to explain lightning or why clouds exist to a kid? Most of us will come up against the limits of our own memory/knowledge when it comes to explaining even such simple things. I don’t think it’s about dumbing down—I believe kids are much smarter and more sophisticated than many adults think—it’s more about breaking ideas down to their constituent parts, unravelling the complexity. Sometimes, it’s also about questioning the bias that you take for granted. The subject came up because Mary asked me if I found it challenging to negotiate bias when writing a book for children. She said that the food system is political and that there are many competing voices arguing this way and that. (Not to mention billions of dollars spent by food companies to support their own interests—my words, not hers.) How did I choose to take a particular stand? Filed under Kids and food, School feeding, School lunch, What's for Lunch? Tagged as hunger, Kenya, kids books about food, school feeding, School lunch, What's for Lunch? I’m thrilled to report that my new book, written with my husband, Nick Saul, is nearly ready and coming out from Random House Canada in the spring. It’s called The Stop: How the Fight for Good Food Transformed a Community and Inspired a Movement. It’s an account of Nick’s 14 years working with the community, volunteers and staff at The Stop Community Food Centre in Toronto to transform it from a tiny, inadequate food bank into a thriving, multifaceted community centre that supports people to grow, cook, eat, share and advocate for good food for everyone. 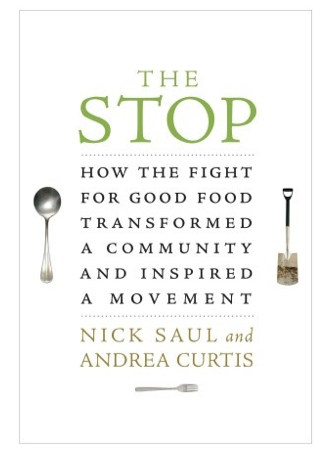 Part story about The Stop’s people and evolution, part argument for re-imagining emergency food, part call for a new kind of food system altogether, it’s written in Nick’s voice (it is his story, after all), but the book was a true collaboration. These days, Nick has left The Stop to head up Community Food Centres Canada, an organization that aims to spread the model they developed across the country. We hope the book will be a great calling card as he and his dedicated colleagues work to bring its innovations to other cities and towns. The Stop is nearly finished (from our perspective—I’m sure the publisher has a few things to do before it ships out in March! ), and we’ve been showing it to others, many of whom have offered very moving words of praise. A number of our food movement and activist heroes—people like Marion Nestle, Jan Poppiendieck, Frances Moore Lappé, Naomi Klein and Raj Patel—have provided blurbs for the jacket copy and publicity material. What a humbling and thrilling experience it is to show your baby to someone you admire and have them say they think it’s important and brave and must be read by everyone. Check back soon to read the advance praise here. What’s for Lunch? has attracted some great responses on the international front, especially in Brazil. Yesterday, the World Food Programme’s Centre for Excellence Against Hunger—a collaboration between the government of Brazil and the WFP that started with a focus on best practises for school feeding—published a Q& A with me about the book and what I discovered in my research about how different nations around the world approach school meals. Below, you’ll find one of their (rather tough) questions. To read the whole interview, click here. Is the emphasis that is sometimes placed on nutritional education a luxury that only richer countries can afford? Or is it wrong to make the distinction between feeding and nurturing? There are times of emergency when almost any food is good enough for a short period—during the heat of war, natural disaster, etc. But I think we all need to strive for something better than emergency rations devoid of taste, culture and pleasure. Children in developing nations should have all the opportunities that children elsewhere enjoy. Nutrition education is part of this. To alleviate anemia, for instance, we need to ensure children are offered food that is rich in iron, but we also need to talk to them about why it’s important, so they can pass it on to their parents and their own children as they grow older. But I also think food literacy needs to be more than just education about nutrients, micronutrients and food groups, educators should be talking with children about where food comes from, who grows it, how it’s grown, the politics of agriculture and the world of processed food. We have a deeply interconnected international food system, so these issues touch not just those in wealthy nations but people everywhere. In fact, you could easily argue that it’s the poor who benefit least in our current food system. Shouldn’t they have a chance to learn about how the system works and why? It seems to me that talking to children and helping them make the links between their food, their lives and those of people in the world around them is one of the very best way to truly transform the system so that it’s sustainable and just. I was really inspired by some groups in Peru that are working in collaboration with indigenous people to reclaim their food culture, language and traditions in part by connecting schoolchildren with elders in their communities who remember the old agricultural techniques and knowledge of plants. This is the kind of food education I’m talking about and it’s no luxury, it’s a necessity. Researching What’s for Lunch? I talked to and read about lots of amazing people all over the world doing great things to improve kids’ access to healthy food. It was very inspiring. But, for me, one of the most moving parts of my research was learning about Dadaab refugee camp on the border of Kenya and Somalia. There, hundreds of thousands of refugees fleeing violence in their homeland are crammed into a space intended for 90,000. Many kids don’t even go to school because the facilities are crowded and inadequate and they have to share text books and desks. But the children who do attend receive a hot meal provided by the World Food Programme. 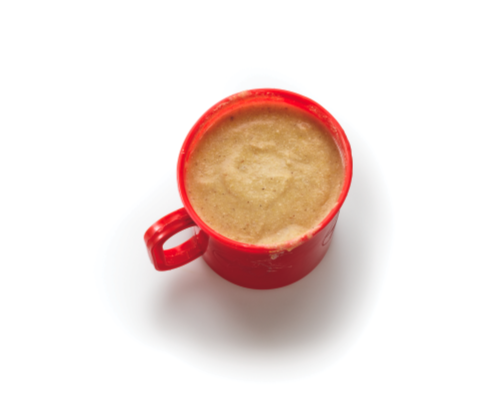 It’s usually very simple: corn-soy porridge fortified with vitamins and minerals. It’s not served in pretty dishes or colourful trays, but for many of the kids it’s the best—and often only—meal they’ll have all day. There, school lunch is more than a perk for busy parents or even a way to embed food literacy into the already robust curriculum, it’s life-sustaining. When I was researching What’s for Lunch? I was blown away by the amazing things kids around the world are doing to reclaim their school lunch. Boycotting the gross meals in their cafeterias, growing gardens, writing letters to their elected officials, and generally standing up for themselves, their health, social justice and their community. It was inspiring and fun to learn about, and put the lie to claims that kids don’t care about what they eat or what’s happening to our food system. I continue to catalogue examples of children who are taking charge of the food they eat and grow. But the Hamilton Spectator story of Oliver Allen-Cillis (and his sister, Piper) has got to be one of the more incredible, mostly because the pair are only six and seven years old. Last summer, this industrious duo started growing veggies in their backyard and selling them at a front yard stand. But this wasn’t for their bubblegum fund. The money they raised went to youth charities, because Oliver had recently discovered that lots of kids don’t have the advantages he does. People in the neighbourhood loved it, and the family earned nearly $700 over the growing season to donate. But the idea was too infectiously good to stay small, and the family collaborated with other local garden/enviro organizations, applied for and won a $20,000 grant from Nature’s Path Organic to spread the backyard garden idea. The money will be used to help other families set up similar gardens, as well as establish a tool-share program, offer workshops to youth and adults, and support local high schools to grow organic seedlings. Now that’s inspiring. Tagged as Canada, hunger, Kids taking action, School lunch, school lunch around the world, school lunch in Canada, What's for Lunch? When you’re deeply immersed in a subject, it can sometimes seem as if everything is connected to it. I remember when I was writing my first book, Into the Blue, and every conversation I had seemed to be somehow related to the themes I was exploring. It was thrilling—a kind of revelation, as if the apparently diffuse world of ideas had somehow—conveniently—coalesced around my interests. Of course, it wasn’t exactly true in a global sense, just true for me at that time. Right now, I’m in the middle of writing another (adult) book about food and food politics—my second book about food in 2 years—and once again it seems to me as if the ideas and themes I’m so engaged in thinking about are everywhere. So when I was asked to show how my book, What’s for Lunch? can be used as a curricular resource in Ontario schools, all I could think was how the ideas in it are connected to everything. I don’t think I’m completely off-base, though. Food, after all, is the great connector. What you eat is directly related to your health and the health of the planet. Food is the biggest industry on earth—growing, packaging, selling, etc.— so, naturally, it’s connected to the economy, the environment and social justice. There are endless ways that creative educators can involve food (and, of course, What’s for Lunch?!) in their curriculum. In fact, more and more people (check out FoodShare’s Meredith Hayes’ CBC interview on the subject here) are calling for “fooderacy” to become an explicit part of the school system. After all, with obesity rates rising among young people, and diet-related health problems exploding, you could argue it’s essential to the well-being of our country. The Stop Community Food Centre has recently produced a fabulous guidebook—the basis of its Grade 5 sustainable food systems workshops—and made it available to teachers and anyone else who needs help integrating food into their curriculum. Tagged as Canada, community kitchens, Cooking with kids, eating with kids, food literacy, hunger, School gardens, School lunch, The Stop, What's for Lunch? On Thursday afternoons during the school year, I run an after-school writing program for Grade 6 kids. It’s called Writing in the City and it’s offered free through the amazing Toronto community-based nonprofit called Word-Play (we just launched our new web site this week—check it out here!). All of Word-Play’s programs operate out of the basement gallery of Toronto’s awesome indie bookstore, TYPE on Queen Street. From the beginning, snacks have been part of the after-school deal. When I started planning the writing workshop (the kid are 11, some will turn 12 in the winter), one of the first things I thought about was how ravenous my own kids are after school most days. They are growing every day and need regular food just to stay focused (come to think of it, so do I, and I stopped growing a long time ago). The way we set it up, they actually have two breaks for food in the 2 hours they’re with us. It’s really simple and healthy stuff: crackers and cheese, pita and hummus, granola bars, apples, carrots, popcorn sometimes. It doesn’t cost a huge amount but it makes a huge difference. Once the kids in the workshop have eaten, they can relax into the space and whatever art, drama, creative movement, storytelling or writing we’re doing that day. They’re energized and no longer focused on their bellies. I think they also like it because it’s a signal that this is not a school program—where they have to bring their own food if they want to snack. When we ask the kids a few times a year about the things they wouldn’t want to change about the workshop, they invariably say THE SNACK!!!! (They love those exclamation marks!) They also talk about the staff and the games we do and the writing exercises we experiment with, but they almost always say they love the chance to eat. I don’t want to downplay all the other great things we do in the writing workshop, but I do think the snack is the foundation of our success. Now if only we could get the Canadian government to sit up and take notice of the myriad—much researched—benefits of feeding our children at school. Tagged as Canada, eating with kids, fast food marketing to children, hunger, Toronto, What's for Lunch?